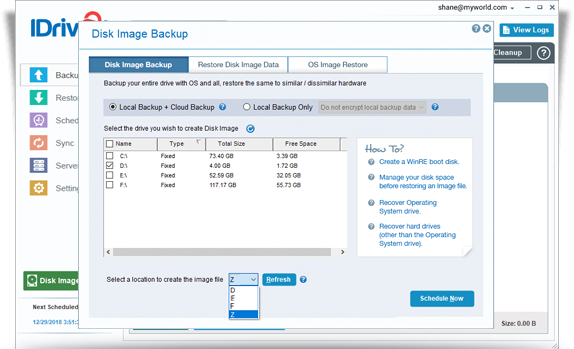 How to create a Disk Image Backup? How can I perform disk image backup to a network mapped drive / NAS Drive? How can I perform disk image backup to an Express device? Does disk image perform incremental backup? Can I restore disk image backup from one drive to another on the same computer or on a different computer? I don't want to restore disk image. Can I still be able to access the contents from the disk image? 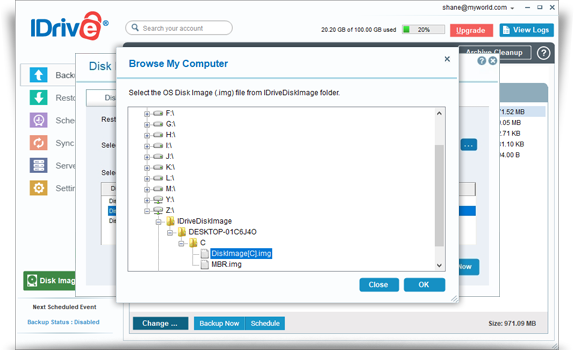 How can I restore an OS disk image file using OS image restore? I have created a disk image file from my PC, using the IDrive application. Can I access it on another OS like Mac, Linux, etc? Can I restore disk images to a CD/DVD or to USB hard drive? Do I need to format the USB drive to restore a Disk Image Backup file? How do I create boot disk and recover my drive using disk image backup file? How to create a bootable USB flash drive to restore disk image? I have a backup (Disk Image file) of 100 GB partition drive. After restoring it to a 500 GB partition drive, the partition seems to be truncated to 100 GB. Why? At the time of running bootrec command, why am I getting the 'Element not found' message for bootrec.exe /fixboot command execution? How do I restore the OEM disk image to dissimilar hardware? I’m getting an error message - ‘Disk structure is corrupted and unreadable’ after executing the rebuildbcd command while restoring the disk image to new hard disk. What should I do? After restore, I am getting the following error message - ‘Disk is not accessible or is corrupted’. What should I do? I performed disk image restore operation (on dissimilar hardware) for Windows 7/Windows server 2008 R2 successfully, but am still unable to boot the operating system. Why? Why am I getting "Not enough memory resources are available to process this command" message, after booting to WinRE command line environment? I have taken the disk image from the system with higher configuration motherboard and am trying to restore to a system with lower configuration motherboard. Why am I not able to boot after restore operation? Windows Operating system is not booting after I tried to perform DiskImage restore to dissimilar hardware/similar hardware. What should I do? Which operating system (OS) supports booting after OS image restore to an external hard drive? 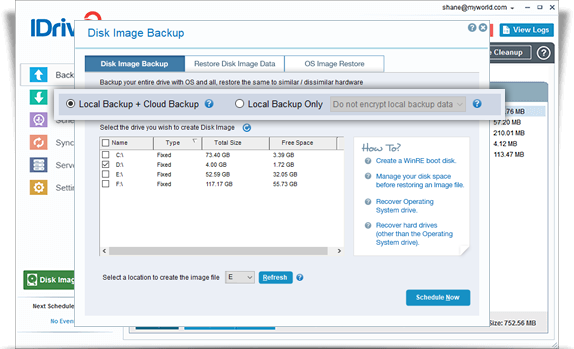 Does IDrive disk image backup support backup / restore of RAID image backup? How can I restore disk image from a NAS / mapped drive to get my operating system working? Disk image is a copy of the entire contents of a storage drive. The disk image represents the content just the way it appears on the original drive, including both data and structure information. To perform Disk Image backup, there are some system requirements to be met. 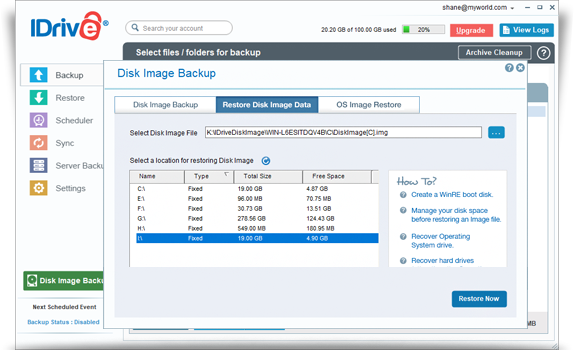 Using Disk Image, you can backup your entire drive to a secondary location, like an external hard drive or to the cloud. Log in with Username and Password. If you had set a private encryption key for your account, then provide the private key. Click 'Disk Image Backup'. The Disk Image Backup screen appears. Click 'Schedule Now'. The Scheduler screen appears. 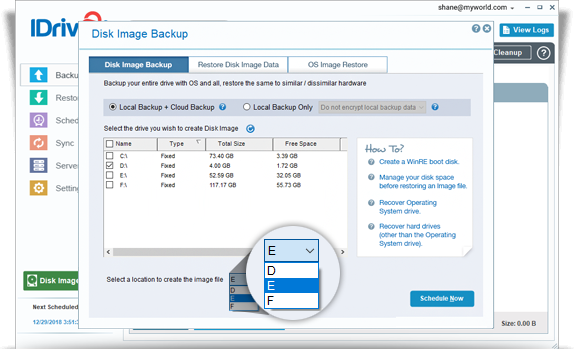 Create a schedule for performing regular disk image backups and click 'Save Changes'. In order to perform disk image backup to a network mapped drive / NAS drive, you have to map your network location to your system. 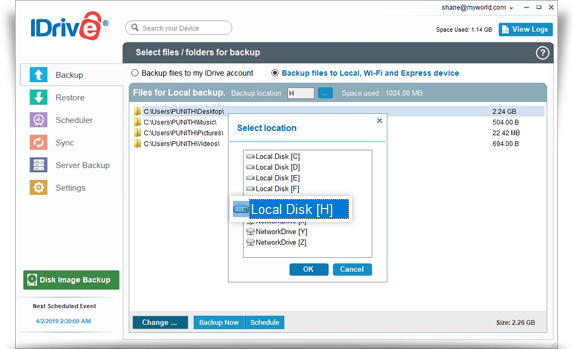 Click the 'Disk Image Backup' tab in the IDrive application. 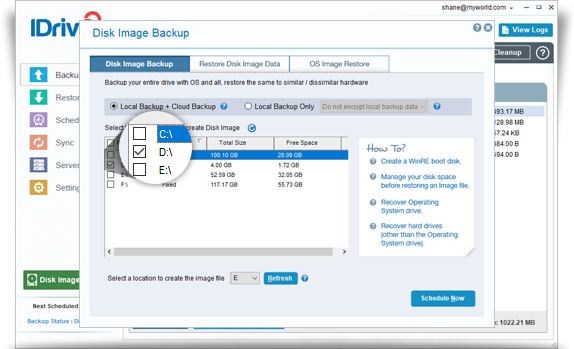 Select a drive to create the disk image backup. Select the network mapped drive / NAS drive as the location for creating the disk image. Click 'Schedule Now'. Schedule disk image backup to perform the backup operation to a network mapped drive / NAS drive. Go to the 'Backup' tab and select the 'Backup files to Local, Wi-Fi and Express device' radio button. Click , select an Express device and click 'OK'. Select 'Local Backup Only' radio button and choose 'Encrypt local backup data' from the drop-down list to encrypt the data backed up to the Express device. From the list of drives, select the drive(s) you want to backup to the Express device. Select a temporary path for local image creation. You can select either a local or network attached drive. Your drive(s) will first be backed up to this local path and then the encrypted backup will be transferred to the Express device. A pop-up message will request confirmation for encrypting the local backup data. Click 'Yes'. 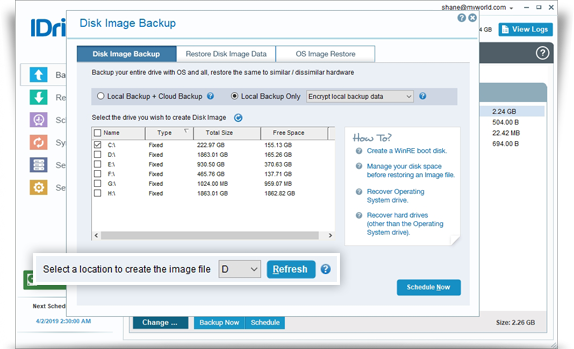 Schedule the disk image backup for a future date and time or select 'Start the backup immediately' and click 'Save Changes'. 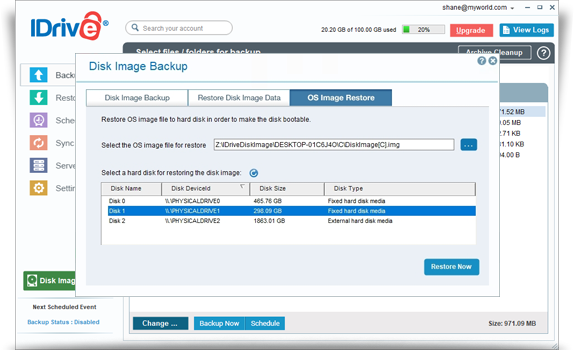 After the backup is complete, click ‘View Logs’ to view the backup details. You cannot backup disk image files to the drive that runs the operating system. If you have selected the Express device as the location for both local image and encrypted image creation, after successful completion of the disk image backup delete the unencrypted local image (delete "IDriveDiskImage" folder) before shipping the Express device to IDrive. Yes, disk image supports incremental backup. Once an initial backup is done, later on only changed blocks of the disk will be backed up during incremental backup. 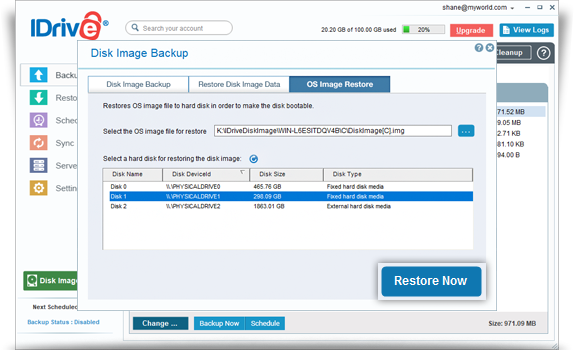 You can restore disk image backup on any drive by using IDrive disk Image restore option on a different computer. Click here to know the recovery details on different computer (dissimilar hardware). Note: On different computer (dissimilar hardware), you can restore the Operating System. You can restore disk image backup on any drive by using IDrive disk Image restore option on the same computer. 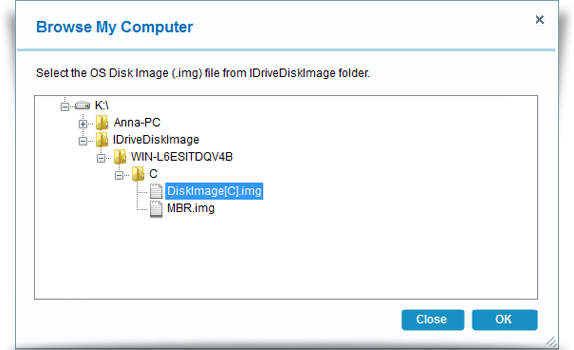 Click here to know how IDrive disk image restore option works. Note: On same computer you can perform Operating System restore as well. Yes, you can easily access your entire OS and its contents on a different computer using IDrive disk image, in case your hardware crashed. Learn more on how to recover the OS Drive on a different computer. To access your data on a different computer, mount the disk image backup file to the new computer and restore files/folders accordingly. Browse the image file which has to be mounted in the OSFMount wizard. Mounted disk image will be shown as different drive (with new Letter) in the new computer. Save the required data from the new mounted drive. Disk image file created using the IDrive application is cross-platfrom compatible, which means you can access the image file created from PC, on Mac, Linux, etc. To access it, simply Mount the disk image file to the specific Operating System. Yes, you can directly restore a Disk Image Backup file to a USB drive or burn it to a CD/DVD. Restoring a disk image overwrites all the existing drive contents with the image file. On the same computer you can perform Operating System restore as well. Click here to know the recovery details on different computer (hardware). No. However, it is recommended that you confirm that the data in your USB drive is either copied to another location or no longer needed, as restoring an image file will format all the data on your USB drive. The Disk Image backup of your Operating System drive, you backed up using IDrive. You can recover the operating system drive in a different computer (dissimilar hardware) or to the same computer. Run Command Prompt window as an administrator. Enter Diskpart in the command line window. Disk Image recovery will maintain the information and the structure (including partition) intact, during restore. Hence, it truncates the 500 GB partition down to 100 GB. To avoid such situation, you should resize the partition before restoring the disk image file on it. At the time of running bootrec command, why am I getting the ‘Element not found’ message for bootrec.exe /fixboot command execution? Before running the bootrec command, ensure that the MBR partition is active. Perform the bootrec /fixBoot again to fix the issue. You can use the OEM recovery disk to make partition of disk image (MBR/GPT, OS disk image) and restore the MBR/GPT and OS disk image. This error message appears for Windows users when their computer tries to access a partition of its hard drive that has a corrupted or unreadable disk structure, thus resulting in a failed attempt to access it. You need restore the MBR/GPT partition to correct the disk structure and run the rebuildbcd command again. After restore, I am getting the following error message - 'Disk is not accessible or is corrupted'. What should I do? To fix the issue, run the chkdsk with flags /f/r/x. Enter chkdsk E: /f/r/x. Replace E with your drive letter which has issues. To boot Windows 7/Windows server 2008 R2, you must have the same motherboard configuration as the original backed up operating system drive. This message is displayed because the WinRE Bootable Media is not created using Windows 8.1 ISO. To resolve this issue, extract the Install.wim file from Windows 8.1 ISO and create a WinRE Bootable Media again. To boot, we recommend that the motherboard and hardware configuration of the system to which the restore is performed should be equal to or greater than the system configuration from where the user has taken the backup of the image. We recommend that you 'repair' the Operating system from Windows operating system bootable disk to boot the OS. Booting of external hard drive after OS image restore depends on the motherboard and other hardware components. From Windows 8.1 operating system, IDrive OS image restore supports the booting of drive. External hard drive should be booted from a different computer after the OS image restore. 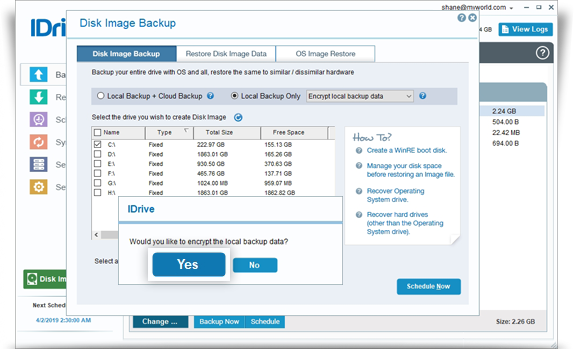 Yes, IDrive disk image backup supports RAID 10 level backup and restore. You can restore an entire drive with the content exactly as it is on the original storage device, which includes both data and structure information. Click 'Disk Image Backup' on the IDrive application. Then, enter your user name and password for network drive authentication. Select a hard disk to restore the disk image. Once the restore is completed, select your hard disk in BIOS and boot your computer, to get your system ready.